The following is an example of a 7 day houseboat itinerary heading East from the marina in Macedon. Arrive at Mid-Lakes Erie Macedon Landing at approximately 1;30pm. Your orientation will begin at 2pm. 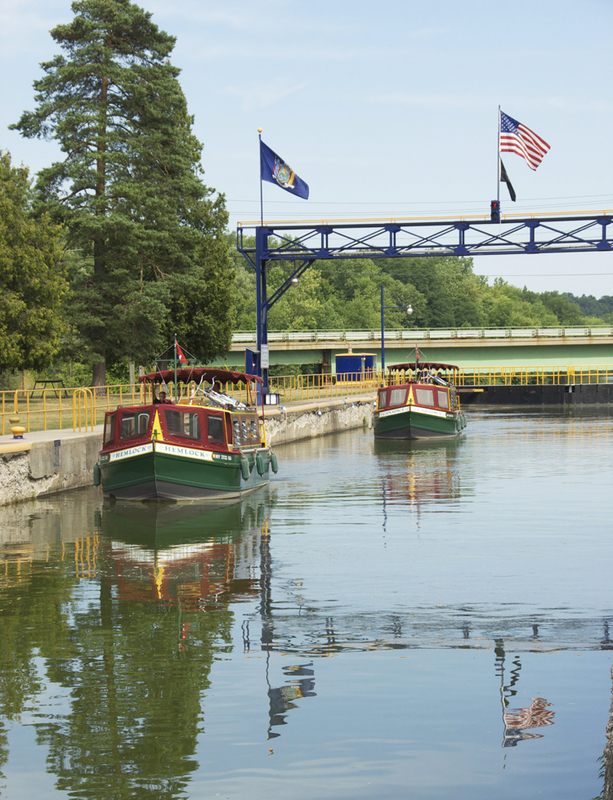 The orientation takes a few hours and ends at Lock 30 in Macedon where staff will guide you through your first lock. After your orientation, head east to Palmyra. 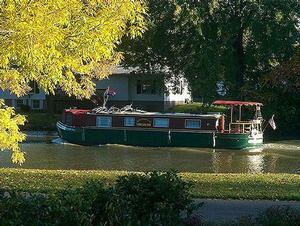 Explore Aqueduct Park then dock for the evening at the canal basin located in the center of town. 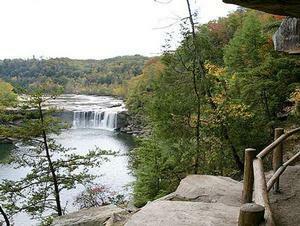 Enjoy the rural scenic communities of Newark, Lyons and Clyde. Newark offers a great docking facility along with many shops and restaurants. Lyons has a nice park perfect for a lunchtime picnic and a nearby grocery store. Clyde, at Lock 26, is possibly the most secluded and beautiful lock in the system. Continue to Lock 25 to May's Point in the heart of the Montezuma Wildlife Refuge, which contains over 9800 acres that provides resting, feeding and nesting habitat for waterfowl and other migratory birds. Arrive early and take a long walk or bike ride along the back roads. 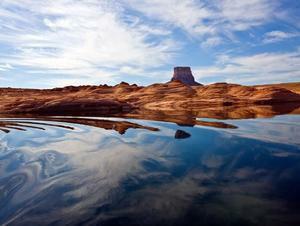 There are many scenic pull-offs to explore the refuge. Lock 25 is a nice quiet place to stop for the night, great for stargazing! 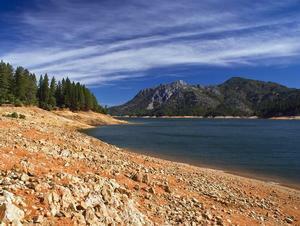 The Montezuma area is a great place for bird watchers. Keep an eye out for a bald eagle! 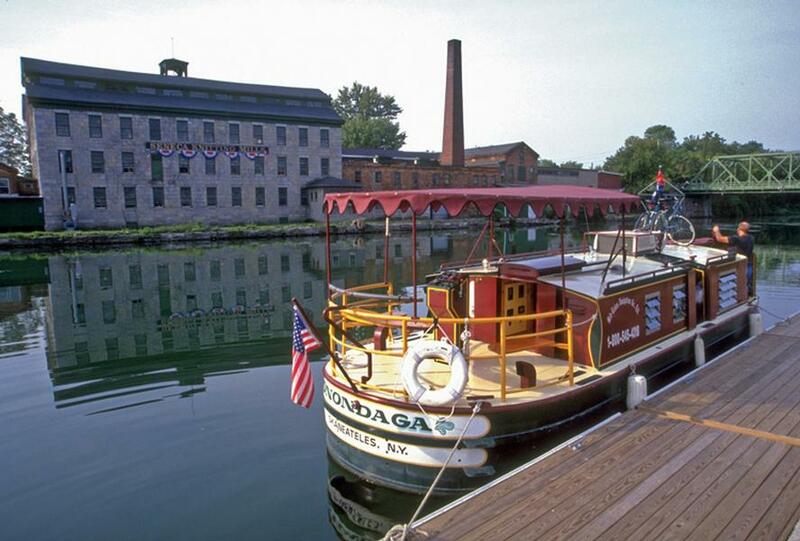 Turn south at the junction with the Cayuga-Seneca Canal to head toward Seneca Falls. 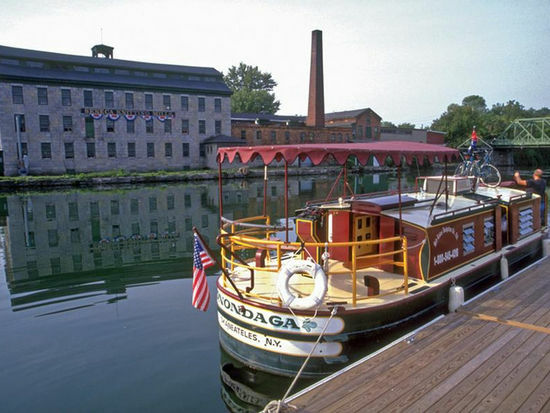 Seneca Falls has a set of 50 foot double locks and is home to the National Women's Rights Museum as well as the picturesque Trinity Church. There's a municipal dock in town, take time to stop and explore. There's a car rental nearby if you wish to tour wine country. Or continue to Seneca Lake State Park, east of Geneva. 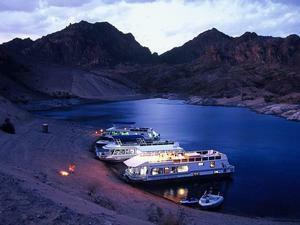 There is a fee for overnight docking and limited available space at the park; be sure to call ahead for availability. Head back west toward Newark. Remember the grocery store in Lyons, it's a great opportunity to restock. Dockage is good in Newark, there is shore power and laundry facilities as well as shopping and docking. There's even a movie theater a mere block away from the canal port. West of Newark, you'll pass through Palmyra and Macedon. Just before Lock 30 (Macedon), stop at Old Lock 60 and see the remains of a lock from 1862. Fairport and Pittsofrd are two great stops, especially for shopping. Both are busy villages with great dockage. Enjoy the evening with some fine dining. 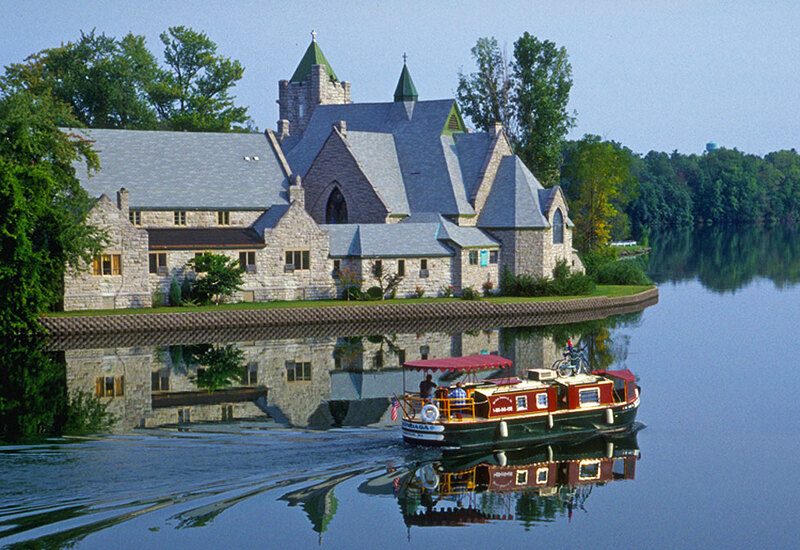 Cruise through the Rochester area, and look down as you cross the Grand Embankment at Bushnell's Basin where the canal si 70 feet above ground! West of Rochester is an area of lift bridges. Radio the bridge tender to have the bridge raised in order to pass. Brockport is a busy college town during the school year. Meander through town and dine at one of the restaurants, or come back to the boat and enjoy a BBQ in Harvester Park. Head back through the Rochester area. If time allows, you can make a turn to the north on the Genesee River, which is navigable through the Corn Hill section of Rochester. Continue on to Fairport where you can enjoy a walk around town. 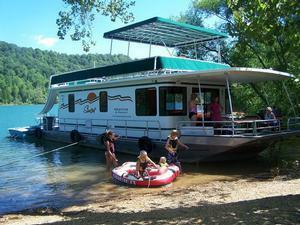 There is a small charge to overnight, so see the dock master when you arrive. It'll take about an hour to get back to Macedon, so you'll want to get an early start in the morning to return the boat by 9am.